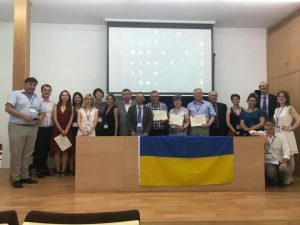 Presentation of the Centre of Excellence at the 2nd International Spanish-Ukrainian Congress: “Spanish-Ukrainian collaboration through communication, education, science and culture from a multidisciplinary perspective”. On June 14, Professor Alejandro del Valle Gálvez participated in the II International Spanish-Ukrainian Congress. The Spanish-Ukrainian collaboration through communication, education, science and culture from a multidisciplinary perspective, is an important event organized by the University of Cadiz, through the Hispano-Russian University Hall (AUHR) and the Faculty of Philosophy and Letters, in collaboration with the Faculty of Educational Sciences, the Institute of Applied Linguistics and the Jean Monnet Centre of Excellence “Immigration and Borders”, and by the Taras Shevchenko National University of Kiev (Ukraine), in coordination with the Association of Hispanists of Ukraine and the institutional support of the Embassy of Spain in Ukraine. The celebration of this Congress represents a very important event in the history of Spanish-Ukrainian relations, since the University of Cadiz is currently the only Spanish and Ibero-American institution that organises events of this nature and scope in the field of Spanish-Ukrainian collaboration. Prof. Del Valle presented in his speech the new Jean Monnet Centre of Excellence “Migration and Human Rights in Europe´s External Borders” and, as one of its most important projects, the Bilingual Master in International and European Studies: International Relations, EU, Immigration and Human Rights, which constitutes the only English-Spanish bilingual postgraduate degree in the subject not only of the University of Cadiz and Andalusia, but of the whole of Spain. The Centre of Excellence will carry out activities in the different campuses of the University of Cadiz, as well as in the Abdelmalek-Essaadi University of Tangier-Tétouan, and outreach activities in secondary and secondary schools in the province of Cadiz. Several Russian and post-Soviet universities have shown their interest, through the AUHR of the UCA, in collaborating in this project and signing agreements for double master’s degrees in this field.